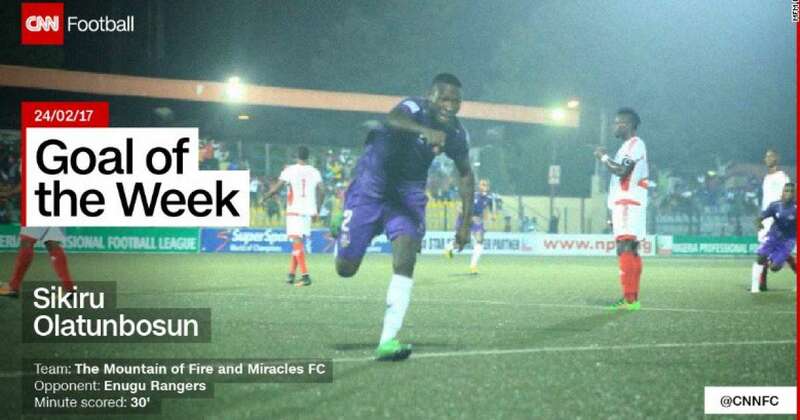 THE Nigerian Professional Football League (NPFL) received a brand and public relations boost last week when a goal scored by Sikiru Olatunbosun of MFM Football Club against Enugu Rangers penultimate weekend was voted as the Cable News Network (CNN) Goal of the Week. The match was a matchday 10 league encounter played under floodlights at the 5,000-capacity Agege Stadium in Lagos. MFM won the match 2-1 and the result would have been recorded as just another statistic but for Olatunbosun’s magnificent opening strike which catapulted the game in terms of significance. I watched the game live on DSTV, so I saw the goal first hand. In the 30th minute, a quick exchange of passes amongst three MFM players in blue shirts ended with Olatunbosun flicking the ball over his marker’s head and blasting an unstoppable left-foot volley into the roof of the Rangers net. I knew immediately that I had just witnessed something special. The adulation that has followed the goal since then is no surprise. Several videos on YouTube have tagged it with various superlatives ranging from “Super Volley,” “Miracle Goal,” “Excellent Blaster” to “Super Screamer.” But the icing on the cake was the CNN award which helped bring the goal into global consciousness and reckoning. Put up against three other goals by Radja Nainggolan of Roma, Y. Tielemans of Anderlecht and Joey Jones of Working FC, Olatunbosun’s “wonder goal” emerged the undisputed best with 82% of the votes. This happy episode for our football league has again underscored the importance of having the games shown on television. For many years, we couldn’t make a headway despite calling ourselves a football-loving nation. But since the League Management Company (LMC) managed to remove all previous encumbrances to the television rights and brought in DSTV as the broadcast partners, there has been incremental improvement in the coverage and followership of the league. The world would have missed Olatunbosun’s wonder goal had the game not been on television. Therefore, no effort should be spared by the LMC to ensure that more NPFL games get on TV. It may take some time, but the Nigeria league is on the right track to reclaiming more of its lost glories if we continue to see more “television goals” like this on television.